Western artist and Thousand Oaks resident Robert L. Rickards has spent over 23 years capturing the historic two-year-plus journey of the Lewis and Clark Expedition from St. Louis to the West Coast in a monumental series of 84 paintings. Rickards’ series depicts the expedition’s optimistic and triumphant departure from Missouri through the discouraging winter of 1804-1805 in the Indian country of North Dakota, across the Continental Divide the next spring and onto the shores of the Pacific in Oregon. “It is my hope to not only inspire people with my work but to also educate folks on this incredible journey,” says the artist. 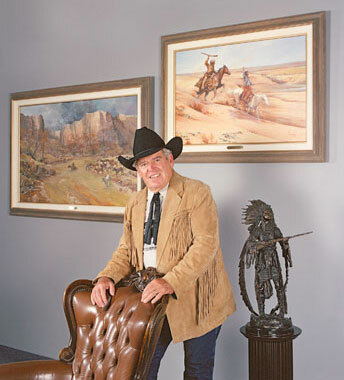 Rickards, a native of Wichita, Kansas, has for the past 30 years created historic paintings that depict the westward expansion of the United States as one of the great stories of endurance and glory, as well as tragedy and loss. Robert Rickards’ documentation took place in 2003. The FOTM Archive contains extensive information about this artist.